Features: ATRAC IC: CXD2671-201GA. 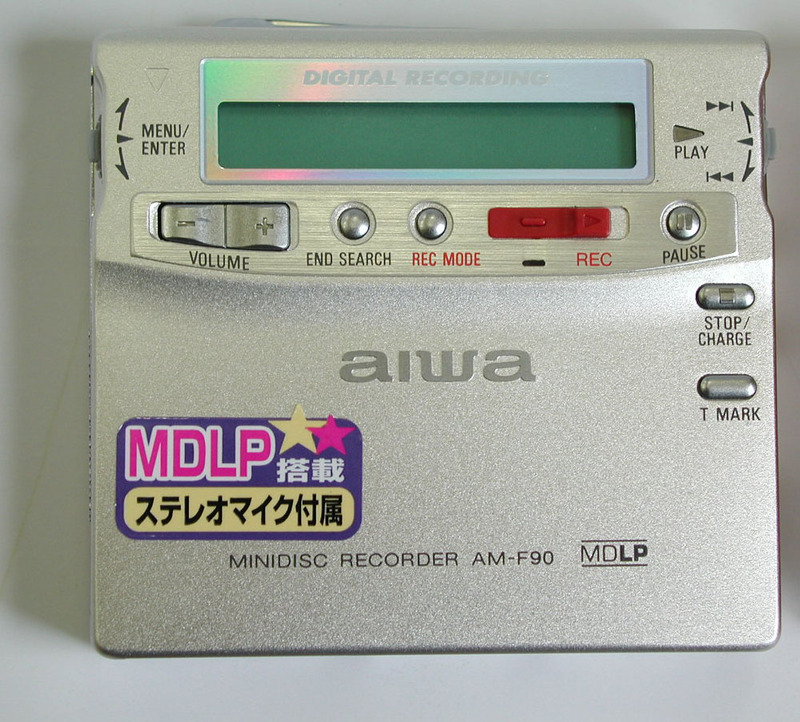 First MDLP mode portable recorder. Record-breaking battery life as of its release. 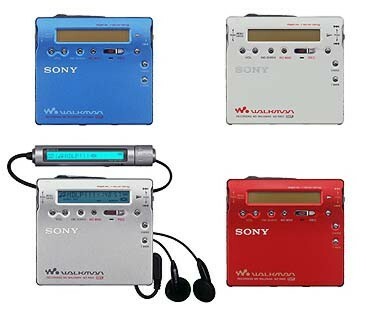 A unique disc based settings ("Personal Disc Memory") feature remembers program play, treble & bass, repeat mode, playback speed (80-110%), and volume settings for up to 20 discs within the unit. 'Double' jog dial. 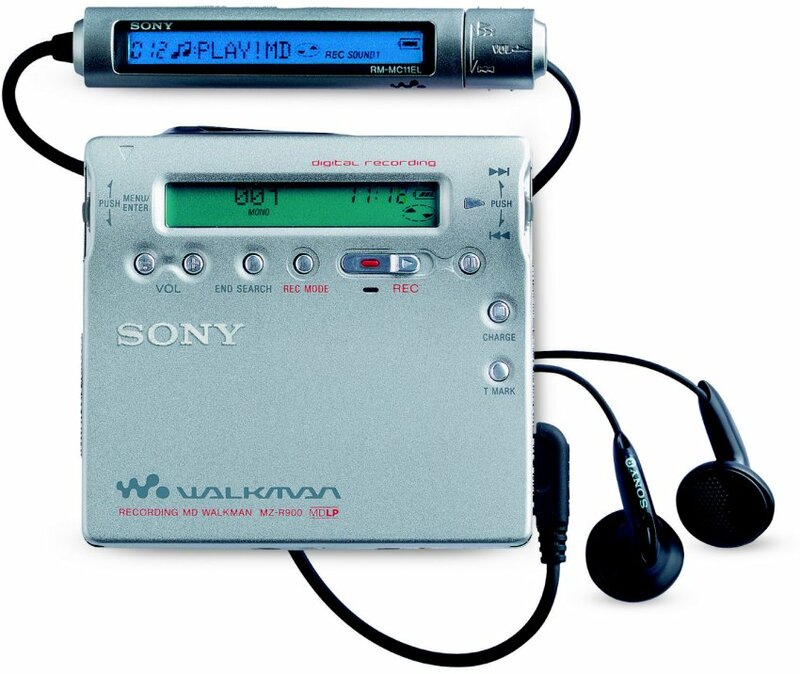 First Sony portable with program play mode. Shock proof memory capacity depends on record mode-- LP4: 160s, LP2&mono: 80s, SP: 40s. Date stamp, digital REC level control, 8 step bass and treble settings, 1-99 minute melody timer. Selectable microphone sensitivity (HIGH/LOW). Aluminum body. Unit can be set to do END SEARCH automatically (no more accidentally erased recordings! ); this settting is in NVRAM and remains even when batteries are removed. Available in silver, white, blue and red. 9 character backlit remote display. G-protection (anti-shock mechanism) present on US and Euro edition but not on Japanese model. How to Set Rec-Posi: If you wish to avoid overwriting the currrent contents of an MD, do the following procedure. All new material will then be recorded from the end of the current contents. While the recorder is stopped, press the jog lever, flip the lever repeatedly until "Rec-Posi" flashes in the display, and then press the lever again. Flip the jog lever repeatedly until the "From End" flashes in the display and then press the lever. The Japanese section of the manual notes that these settings are retained even if the power is cut (oddly, the English section of the manual incorrectly translates this point). Overwrite recording is done by first positioning with Play-Pause at the overwrite point. Beep on remote is defeatable. Offers auto track marking at selectable time intervals 5 min, 10 min, 15 min. Mic sensitivity low and high are user selectable via software switch (not physical switch on the unit as with MZ-R50 and earlier). Line Out mode will not drive headphones, leading me to believe it differs from the Line Out mode in the R90, which will. Might be quieter? LP2 mode sounds quite good. LP4 mode is useable for music, but not for the most demanding listening. Unit's startup, track switch, and esp. FF/REW times are improved over the MZ-R90, though still not offering the responsiveness of the older (e.g. MZ-R50) class machines. I didn't specifically test the LP4 mode in this manner, but I have used it. I would probably rate it somewhere around 7.6. I should note that it took very, very careful listening with my eyes closed and as little outside noise as possible for me to be able to hear the differences between the 4 versions. I would say that under normal listening conditions there would be no detectable differences between the recordings. User Comments on distortion: Tim Corcoran found distortion on two different MZ-R900 units. This problem does not exist on all units. Brian Youn's wonderfully detailed review of the unit. A user's detailed comparison review between the Sharp MD-MT66 and Sony MZ-R900. IGN's positive review of the Sony MZ-R900. 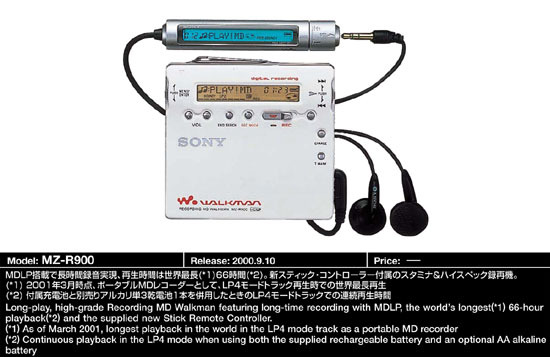 Sony's Japanese page for this unit (machine translation). 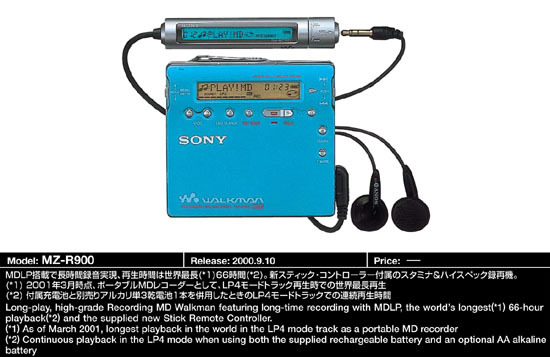 Sony's official page for the MZ-R900 tourist model. 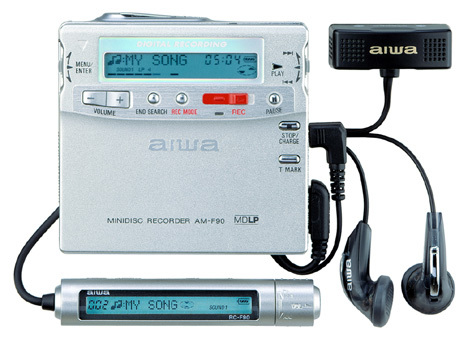 Aiwa's official English AM-F90 page (a clone of the MZ-R900). A machine translation of a Japanese news blurb on the AM-F90. T's Tables has further information on this unit. MDLand has an e-tailer page for the MZ-R900. David Console Shop has the Sony MZ-R900 for USD$275. FelsWeb offers the Sony MZ-R900 for USD$358. Japan-Direct has useful information on the MZ-R900 posted on their site. T's tables has photos from recent MD brochures for the Sony MZ-R900. 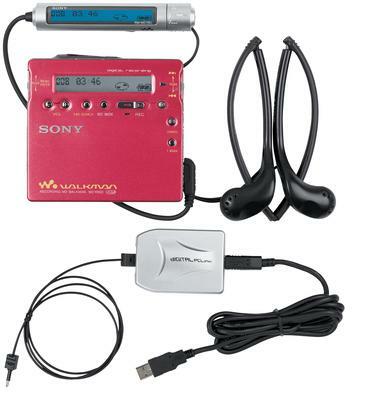 MD Portal, a Singapore-based online MD vendor, is selling the Sony MZ-R900. A fanpage called Minidiscland has several photos of the unit. Consumer level Sony MZ-R900 review on TechTV. CNet comparison of the Sharp MD-MT877, Sony MZ-R900 and MZ-R700. By changing an MZ-R500 or MZ-700 unit's EEPROM values several MZ-R900 features can be added.